Great Location! Comfortable, Cool Penthouse Condo Off 5th Ave! Welcome to DOCA Tres Oh Tres. Walk to Mamitas beach, return to the rooftop pool for a chill down, enjoy the sunset, walk your tour of shops and discover the best restaurants and nightlife of Playa just a few blocks from your central location. So much of Playa is less than 6 blocks from DOCA Tres Oh Tres. Best of all for most of us, when you return to your condo, you will enjoy peace and tranquility. DOCA Tres Oh Tres is located in the center of the 'Italian District,' only 1 block from the famous La Quinta (Fifth Avenue), yet in a surpassingly quiet spot on 10th Avenue across from the sports stadium, a wide-open welcome neighbor. Catch their breezes as they freshen your home away from home. DOCA Tres Oh Tres and all the furnishings are new, comfortable and smartly selected to make your visit comfortable, secure and fun. The building entrance is by electronic password. The elevator is from the underground parking garage (automatic garage door opener) to the rooftop. Tres Oh Tres is one of only 3 on the penthouse level. Wireless internet is free throughout the building. The rooftop 'vista del mar' is shared among only 9 condos. Sunrise and sunsets as you choose from this spectacular vista. The photos on this site make the best presentation. Your photos will tell the best stories. DOCA Tres Oh Tres : Both bedrooms include thick, queen-sized beds and LCD HDTV TV, and ensuite bathrooms. The all electric, stainless-steel kitchen with dishwasher. The kitchen opens through the dining (seats 6) and living room with LCD HDTV large-screen TV, iPod-ready stereo. Private laundry room. Air-conditioning in all rooms. Granite and marble and hardwood finishes throughout. Expansive serving window with outside bar brings the outside into the living area. A tub for two on the private wraparound deck. Cable tv is a full viewing package. Nothing is basic about DOCA Tres Oh Tres. As a family of 4 we are small business owners who enjoy being able to just get away. Playa del Carmen has been one of our favorite spots for many many years. Playa del Carmen is a small town with an international feel. The beaches are beautiful. 5th Ave has many great shops for looking or buying and many cafes and night spots. You do not need a car to enjoy Playa del Carmen. We enjoy morning strolls to get breakfast out on 5th Ave. while winding down from our normally busy lives. We enjoy the sand and the beautiful clear turquoise ocean for sunning and swimming. The 2 pools are great on our rooftop pool shared by only 8 other condos. The sunsets are beautiful over the view of the town of Playa del Carmen. Very centrally located in heart of Playa! Sports stadium directly across st. Provides ongoing entertainment, and fitness opportunities! Smaller bldng. = more intimate setting. Met other couples in same age & stage of life! If you want to be in the middle of the action, this is ideal! Thank you for coming and staying with us. We hope you guys had a great time in Playa!! Everything was great but the rooftop area with 2 pools was the real star. The condo is lovely. Checking in couldn't have been easier as we were met by a liaison at the door. The place was spotless on arrival, the building very secure and all the amenities one could hope for are present. The location couldn't be better. A few minutes to the amazing beach, right in the heart of PDC. Shops, bars, restaurants, banks, taxis, buses, etc all within walking distance. The rooftop pools (yes, there are 2!) were the real star. One is a regular pool with a swim up bar (you have to supply your own bartender!). The second is a long lap pool. There's an outdoor shower, bathroom, loungers, palm trees and a lovely sitting area under a beautiful mural of Frida Kahlo. As there are not many units in the building, we had the rooftop to ourselves for most of the week. It was truly splendid. Across the street is the stadium where the soccer team, FC Playa, train and play their games. They have a really nice running track, basketball and tennis courts that are open to the public. It couldn't have been more convenient so I had no excuses not to go for a few runs during our week stay. I quickly learned to exercise early to beat the midday heat! We did a few day excursions to cenotes and the ruins down in Tulum. There is a taxi stand a block away which made it easy. The bus station and collectivo vans were a 15-20 min walk. We really enjoyed our stay in PDC and were thrilled with our accommodation. Quite frankly, the best vacation that we have ever had!! The condo is as pictured with everything that you need for the kitchen, living room, bedrooms, etc. Everything was clean, fully functional and exceeded expectations. 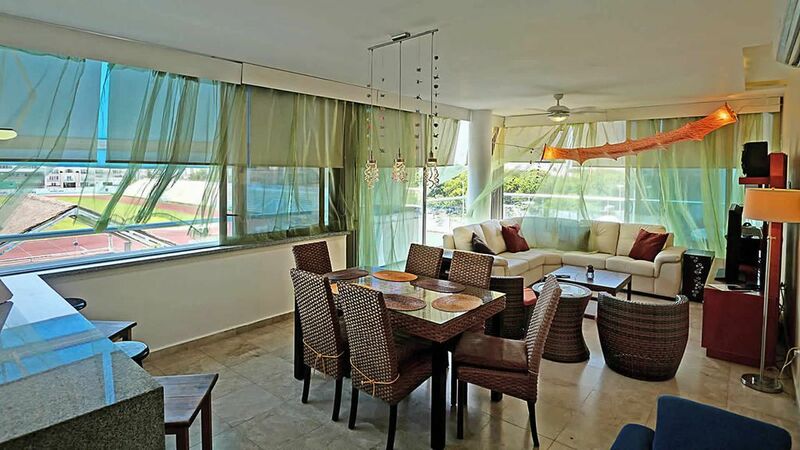 The locations is absolutely perfect for Playa Del Carmen, one block from 5th Ave and a 5 minute walk to the beach. The pools on the roof were well cared for and we were the only ones there when we went. Best of all is the constant entertainment you will get from having a perfect view of the sports complex. Each morning and evening you are treated to basketball games, dance/zumba lessons and an occasional soccer match. We can’t wait to return!! Thank you so much for having us. We are very happy you liked our condo. It is our home away from home and we hope our guests feel that way as well. If you decide to come back to Playa del Carmen please remember us. Wonderful modern spacious 2 bdrm and 2 bthrm apartment. Perfect for our week in Plaua del Carmen. Kitchen has everything you need and the apartment is modern and tastefully furnished. Great roof top deck and pool for the sun lovers. The owner and manager are friendly professional and helpful with the local info. Would certainly stay here again and recommend this apartment to anyone visiting playa del Carmen. One slight downside is if you like fresh air and are a light sleeper the traffic noise and lights from the recreational park might be a bit of a challenge But 5 out of 5 all around. A wonderful week in Playa del Carmen. Thank you for your review. We have tried to make DOCA 303 a place that we can feel at home in and am glad you seemed to feel that way too. Playa del Carmen is truly a special place and we are happy to have a place to enjoy it when we visit. We very much appreciate your visit. This was our first trip to Playa Del Carmen and it is now my absolute favorite place in Mexico. The condo was clean, comfortable and had all of the amenities you could want. Gary, the property manager was also quite helpful with information. The pictures on the web are very accurate; the place is as beautiful as they look. There are two tennis courts (with lights) right across the street which we loved. Very close to the main street with tons of great restaurants and shops. The rooftop pool was like having our own private pool; we only saw two other people the entire 8 days we were there. The beach is also convenient. It was truly a perfect vacation for us and we will return for sure! The Owner was a pleasure to work with and she made everything easy with the charges, deposits, etc. I highly recommend this condo for your vacation; you will not be disappointed. We have enjoyed sharing our home away from home with you. We consider ourselves fortunate to be able to own a beautiful home in paradise to share with friends and guests. It's taken me a while to write this review but I wanted to make sure to share my thoughts. I'm a committed VRBO traveler - a much more personal experience at prices better than hotels / resorts. My wife and I scheduled a week stay at the condo. Gary - the property manager - picked us up at the airport and took us directly to the condo (for a reasonable price). The unit itself is beautiful - the pictures online reflect this - very clean and modern. We loved the private deck off the unit and also the rooftop pool - quite the bonus! We were frequently the only ones at the pool and even when others were there it was never too crowded. The location was great - a block from the main drag and across the street from a soccer field. It’s close enough to everything yet not noisy at night. Gary and Sharon (the property owner) were excellent. Both were available when needed. Mid-way through the visit we decided to extend our stay we liked it so much. We will definitely return - next time we plan on bringing two of our kids (we just used the second bedroom as storage on this trip). ECO-Adventure Parks(Xel-HA, XPLOR, Xcaret, Cenote Parks) Tulum Ruins, Chichen Itza, ferry to Cozumel Island, Golf, Charter Fishing, scuba diving, snorkeling, shopping, 5th Ave night life-people watching, dining alfresco, ENJOYING THE BEACH!! !